Price Improved! 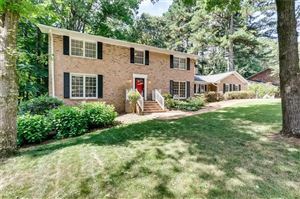 2638 Smoketree Way NE, Atlanta GA 30345 listed for sale by Sally English, Associate Broker, Realty Associates of Atlanta LLC. Call or text Sally English 404-229-2995 for easy showings. Sally English and The English Team specialize in homes and neighborhoods with convenient commutes to Emory University, The Centers for Disease Control CDC, VA, CHOA, FEMA, FBI, Mercer University and Midtown Atlanta. Walk or bike to Leslie Beach Club from this traditional 2 story.Wall between kitchen and family room opened up to create more views and interaction.Kitchen updates include quartz countertops.Bedroom and full bath on main floor. Hardwood floors throughout main level including family room, living room, dining room, bedroom and halls.Spacious master bedroom on second floor with 2 large walk-in closets.New carpet throughout bedroom level.Private backyard. Art glass front door. Side drive-in garage.New driveway and walkways. Easy commute to Emory,CDC,CHOA. Students at 2638 Smoketree Way NE, Atlanta GA 30345attend High Scoring Henderson Mill Elementary School, Henderson Middle School and Lakeside High School in the DeKalb County Public Schools System. Globe Charter school is nearby. Nearby private schools include IHM, Marist, Saint Pius X and Paidea – all located within a reasonable commute. The home is within an easy car commute to Emory University, Centers for Disease Control, CHOA, VA hospital, Mercer University, FEMA without using any Interstate Highways. DIRECTIONS: From Downtown ATL: I-85 North to Shaloowford Rd Exit. Right on Shallowford Rd. Left on Briarcliff Rd. Left on Briarcliff Way. Left on Henderson Mill Rd. Left on Leslie Dr. Left on Smoketree Rd. House at corner of Smoketree Rd and Smoketree Way. 2470 Sq Ft finished space per Appraisal. 0.41 acre lot per DeKalb Tax records. Entrance foyer features pegged hardwood floors, staircase to second floor, art glass front door with two sidelights featuring the same art glass. Cased openings to formal dining room and formal living room. Dentil block crown molding. Coat closet. Formal living room also has hardwood floors. 2 windows. Dentil block crown molding. Formal dining room features hardwood floors, double window, chandelier, dentil block molding. Large storage closet under staircase. Bedroom on main floor has hardwood floors, two windows, closet. Ceiling fan and light. Would make an excellent home office or study. Adjacent to full bath. Full bath on main floor has ceramic tile floors, pedestal sink, tub-shower combination, linen closet. Large kitchen has a ceramic tile floor, white cabinets with granite countertops. White double bowl sink with pull out faucet. Premium appliances include a Bosch dishwasher, Whirlpool smoothtop cooktop, Kenmore wall oven. All in black glass finish. Microwave oven. Eat-in breakfast area between kitchen and family room. Family room is open to kitchen. Hardwood floors, recessed lighting. Exposed beams. Stone fireplace with gas log lighter, glass doors, custom mantle and built in bookcases. French door to patio. Door to mudroom. Mudroom between family room and back door/porch to driveway. Patio in back yard offers a private space for outdoor dining and relaxing. Brick finish. Fenced backyard. Landscaped. Teo car side drive-in garage. Attached. Electric garage door openers. Second floor bedroom level features new carpet throughout. Spacious Master bedroom suite has two walk-in closets. Two windows. new carpet. Private entrance to master bath. Master bath features a marble tile floor, white vanity cabinet with two vanity sinks and ceramic tile countertop. Tub-shower combination. Two additional bedrooms on second floor. Both with new carpet and good closets. One has a glass display cabinet. Up Hall bath features a white ceramic tile floor, pedestal sink, tub-shower combination. Laundry room on bedroom level with washer and dryer connections.